Brand new features, exciting interactive displays and conservation work are now all on show at Tamworth Castle - thanks to Heritage Lottery Funding (HLF). The £1.6 million project 'Out of the Bailey and into the Keep' has seen huge improvements made at the Castle, including interactive displays and dressing up, re-opening and restoring the steps at the side of the monument, improving the pathways and work carried out on the motte to help secure it for another 900 years! The majority of the funding came from HLF with further investment from both Tamworth Borough Council and Friends of Tamworth Castle. 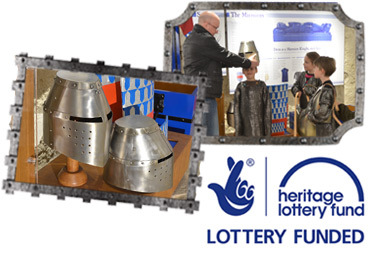 The new displays means families can continue to access and experience Tamworth's past, while seeing original features which the Heritage Lottery Fund project has helped unveil, making the Castle's history more interesting and exciting than ever before. A brand new armoury means youngsters can dress up as knights from different periods of the Castle's history and see the wide range of weapons which were used, you can be transported back in time as you hear the battle cries of soldiers on the battlements while display boards around the Castle give a wonderful insight into what life was like - including a medieval toilet! Some of the new features uncovered means when visitors enter the Castle they get to see it exactly as James I would have when he visited 400 years ago. When areas of the ground floor were excavated, evidence of fire was found, which was believed to be related to the Peel family back in the 18th century when the Great Hall was used as forge. And in the same room, a small earlier floor was also uncovered - it is hoped this will reveal more secrets of what the Castle was used for. A secret passage was also discovered which is believed to have been used as an emergency exit for people needing to flee the building! The project was carried out in two stages - to carry out excavation and conservation work and also to make improvements to the overall experience our visitors would have. The application was in competition with other supportable projects, so the first-round pass was an endorsement of outline proposals. The funding allowed us to develop our ideas and request further funding to make the changes we wished to. We also carried out consultation with visitors and also Tamworth residents to find out what they thought of the Castle and what they would like to see more of. Overwhelmingly people told us they loved the living history re-enactment which Tamworth Castle is so well known for - and as part of the project a Medieval Household re-enactment will be developed for schools and visitors. We also have groups visit to discuss the changes we planned to make which gave us fantastic feedback about the project and the plans we had in place.